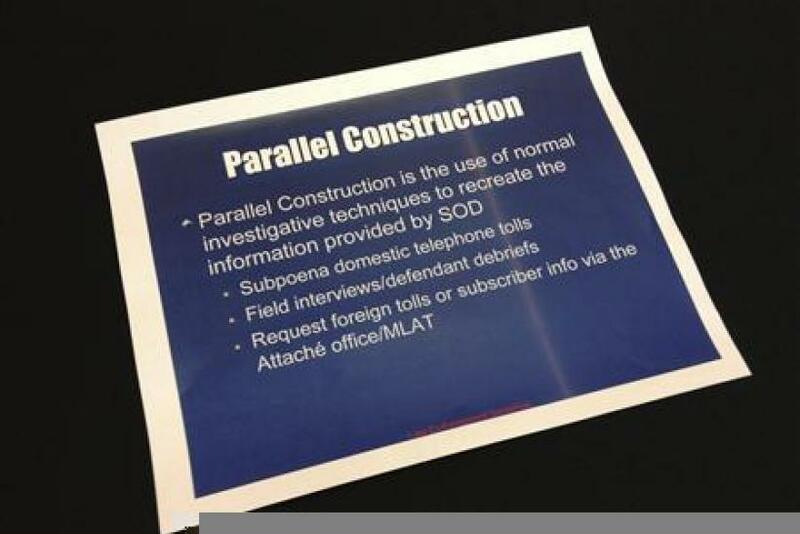 A slide from a presentation about a secretive information-sharing program run by the U.S. Drug Enforcement Administration's Special Operations Division (SOD) is seen in this undated photo. An Internal Revenue Service training manual has revealed key details of a Drug Enforcement Administration surveillance program and asked agents to omit any references to the program in official documents. According to Reuters, a 350-word section of the IRS training manual instructed tax agencies to falsify records of any tips reported by the DEA’s Special Operations Division. Specifically, it asked tax agents to delete any mention of the program in official documents such as affidavits and court documents. Reuters has pointed to the entry -- published online between 2005 and 2007 -- as proof of the IRS’ cooperation with surveillance programs by the NSA, CIA, DEA and FBI. On Monday, Reuters reported that the Special Operations Division of the DEA operates by taking information collected by the National Security Administration and using it to begin criminal investigation on Americans. "Special Operations Division has the ability to collect, collate, analyze, evaluate, and disseminate information and intelligence derived from worldwide multi-agency sources, including classified projects," the IRS document states. "SOD converts extremely sensitive information into usable leads and tips which are then passed to the field offices for real-time enforcement activity against major international drug trafficking organizations." The manual goes on to suggest that tax agents take information provided by the Special Operations Division and use it to begin new, seemingly “independent” investigations. "Usable information regarding these leads must be developed from such independent sources as investigative files, subscriber and toll requests, physical surveillance, wire intercepts, and confidential source information,” the IRS manual continues. “Information obtained from SOD in response to a search or query request cannot be used directly in any investigation [i.e. cannot be used in affidavits, court proceedings or maintained in investigative files]." Did Snowden Actually Harm US National Security?